Holy Cross church in Church Road, Basildon. On 24th March 1950 the church, along with a number of others in the Basildon area, became a listed building on the government departments' Ministry of Works list of buildings of historic interest. The church has since become a Grade II* listed building. Basildon's first Garden of Remembrance was created in the old churchyard. A 600 sq. ft. lawn with shrubs in each corner was officially opened on 3rd May, 1970 by Rev. Brian Buxton in a special service attended by the Chairman of Basildon Council, Fred Champ, M.B.E. 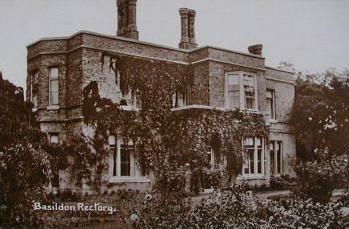 The former Basildon Rectory once stood in Rectory Road, Basildon, close to the junction with Church Road. It was demolished around 1960 as the site was required for the Ford Tractor plant which opened in 1964. Rectory Road originally ran between Pipps Hill Road and Gardiners Lane. In the early 1970s during the creation of 'Aquatels Zoo and Ecology Centre' a small section of the road at the Pipps Hills Road junction was retained and renamed Pipps Hill Close and diverted to open out into Cranes Farm Road. This was still residential up to the early 1970s when the last house was demolished to make way for the new zoo, which later became the Festival Leisure Hall in the 1980s. In the late 1990s the Festival Leisure Park was created and all traces of the road disappeared. At the Gardiners Lane South exit the road is still evident, though now called Gardiners Close. Here the road is sparsley residential but could disappear as part of a planned Gardiners Lane regeneration scheme. In more recent times the church has been twinned with St. Andrew's in The Fremnells under the title St. Andrew's with Holy Cross. Text researched and written 2005. Copyright © 2005, B. Cox - Basildon History Online. All rights reserved.